North Carolina Dance Theatre and Neiman Marcus unite for the fifth annual Runway for the Ballet on Saturday, February 11, 2012. Runway for the Ballet is presented by Carolinas Medical Center and Shumaker, Loop and Kendrick, LLC. Runway for the Ballet takes place in the intimate performance venue, The Patricia McBride & Jean-Pierre Bonnefoux Center for Dance on North Tryon Street in uptown Charlotte. 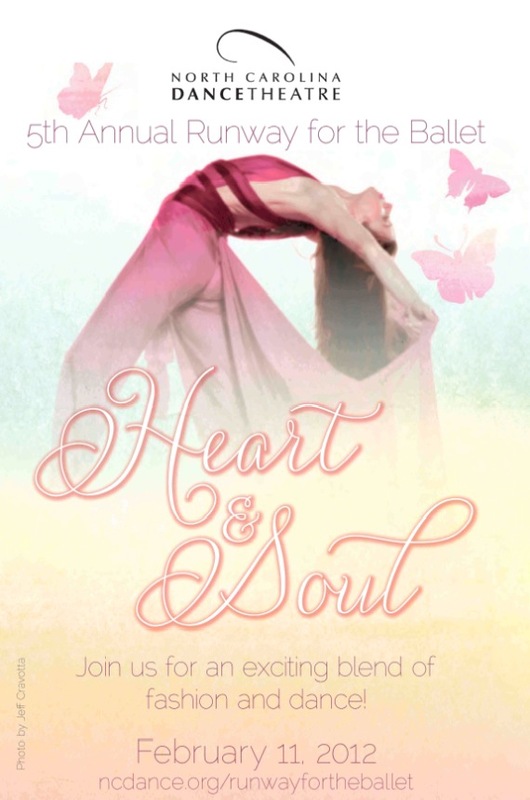 The shows “Heart & Soul” theme is a blend of fashion and dance, highlighting upcoming 2012 fashions from sponsor Neiman Marcus, interspersed with vignettes from Dance Theatre’s popular shows. Dancers from Dance Theatre will also serve as the models for the fashion show. Scott Provancher, President of the Arts & Science Council and Sonya Barnes, CEO of Harris & Barnes, Inc, will emcee this event. Presented in two stylish shows, the 4 PM. matinee provides fun and fashion for all ages, complete with a pre-show reception including complimentary drinks and hors d’oeuvres. Then, at 8 PM, find your most stylish outfit and celebrate a night out at our evening performance and post-show reception. Tickets include show admission and a reception. VIP tickets are also available for both performances and include prime VIP seating, exclusive cocktail and gift bags. Raffle tickets are available for this event for $10 each and prizes include a $1,000 Neiman Marcus shopping spree, an overnight stay at The Ballantyne Resort, wine tasting and a custom painting.